The greenest city in Malaysia, where you can see the modern and unique structure and architecture including the 650 hectares man-made lakes. 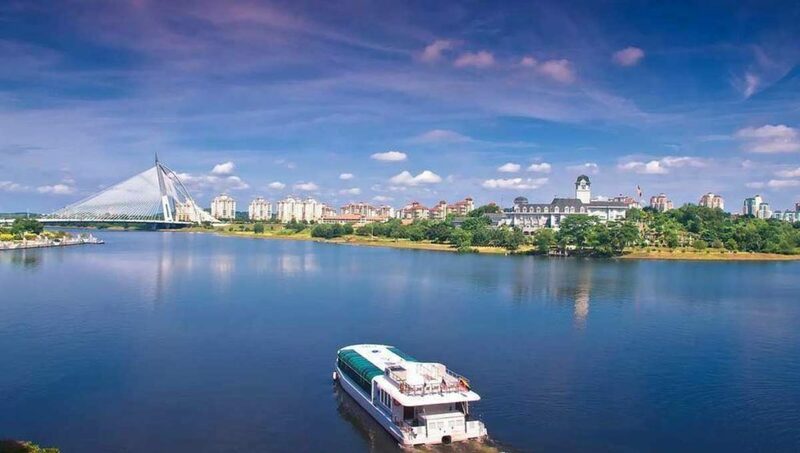 Do the Boat cruise in Putrajaya, you can see beautiful landscapes across the beautiful water and wetland. The cruise is the best way to take in some amazing landmarks in Putrajaya such as the Prime Minister’s office, the Pink Mosque, the unique bridges (there are 8 bridges altogether) and more. Various cruise ship options are available. Now when I say cruise ships these are not your regular huge cruiser. These cruisers can hold from 60-80 people and the ride is around 45 min. You also have the option of a dinner cruise. The cruise starts as early as 10 AM. The price for a regular cruise is RM50 and the dinner cruise is for RM80. You can book your cruise here. Marina Putrajaya operation hour starts from 9.00AM until 9.45PM. Marina Putrajaya is open to all public and operates daily including on weekends and public holidays. It offers two types of facilities namely land-based facility and lake-based facility. Land Based Facility – Marina Putrajaya provides recreational indoor facilities such as an indoor swimming pool, snooker and pool lounge, karaoke room, squash courts, gymnasium, steam bath, and sauna. Lake Based Facility – Tourists can enjoy boat rides here besides learning water sports like jet skiing, wakeboarding, water skiing, canoeing, and kayaking. The biggest attraction is the musical fountain in the evening with a special show each Saturday. 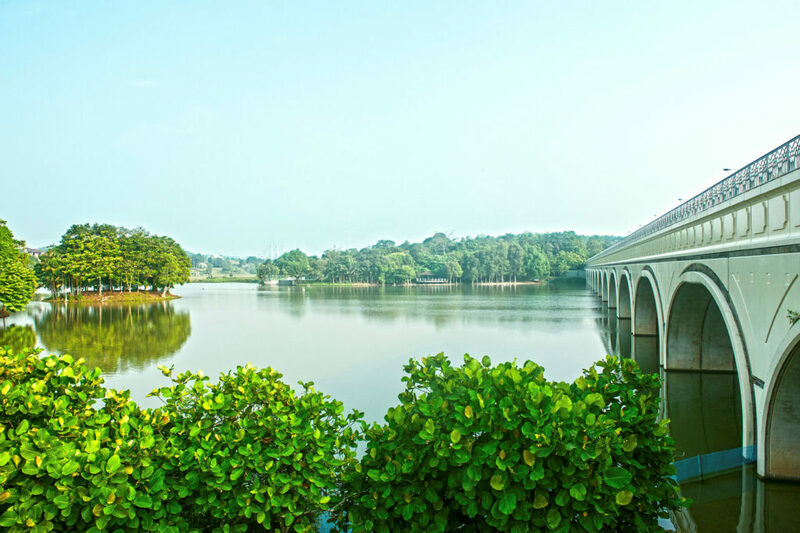 Putrajaya Wetlands Park in Putrajaya is one of the largest constructed freshwater wetlands in the tropics. 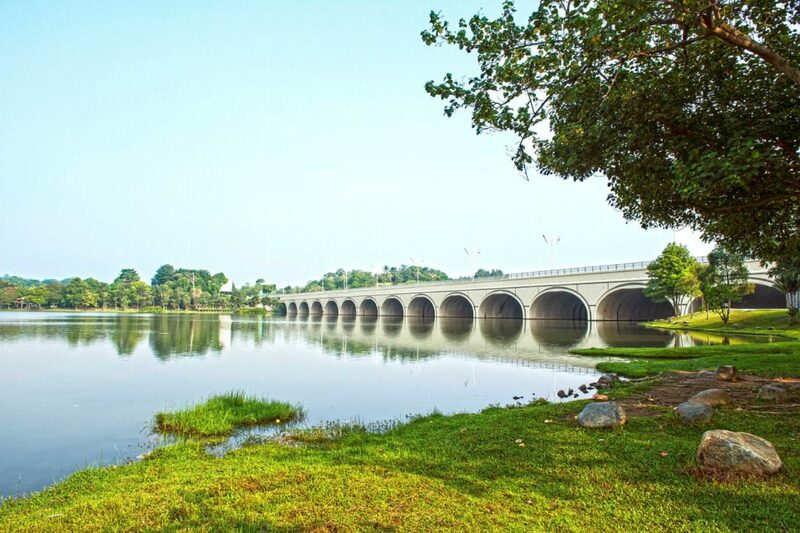 It is the first man-made wetland in Malaysia, which includes a Wetland Park and the wetland areas. Do check out the Nature Interpretation Center, which is a mini-museum, explaining how wetlands work and introducing the types of flora and fauna found in the park. More than 100 species have been spotted around the Wetlands Park, making it a great place for bird watching. Some of the birds that can be spotted here are Purple Swamphen, Jungle Fowl, Painted Storks, Pelicans, Swans and the Buffy Fish Owls. Birdwatchers can climb up the 18-meter lookout tower located in the Wetlands Park for a bird’s-eye view of the area and birds flying around it. 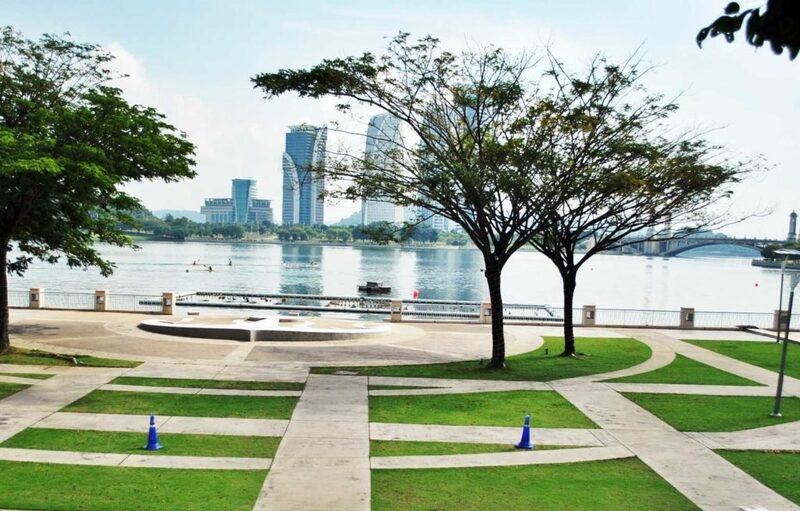 It is located on the waterfront in the center of Putrajaya. From a distance, it looks like a giant pencil standing on an oil rig but it is in the shape of the hibiscus flower when viewed from the top. The main pillar has a height of 68 m. Its main pillar has diameters measuring from 3 m at the base, 4 meters in the middle and has a pointed tip. The monument constructed with solid metal and strengthened with metal structures. 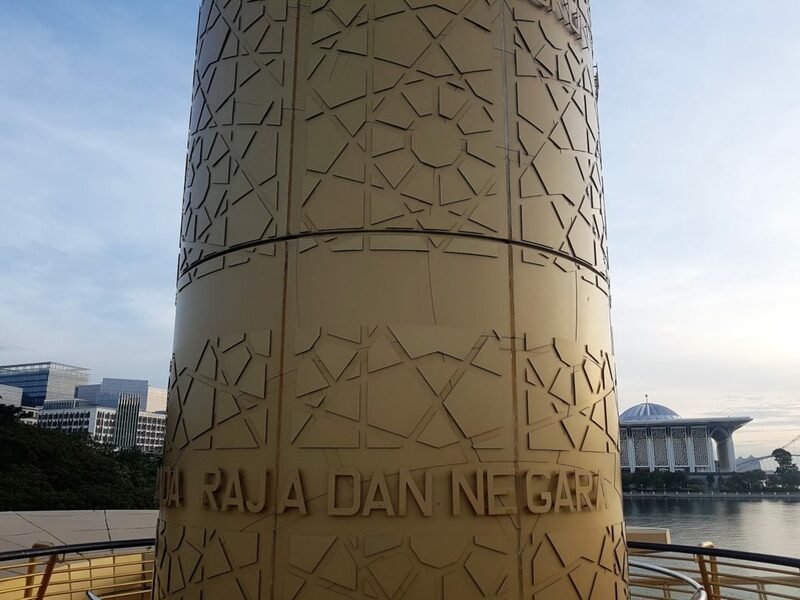 At night, the monument serves as a beacon with strong light projected at 360 degrees and sweeping lights visible from various locations in Putrajaya. The lights also guide the cruise boats. 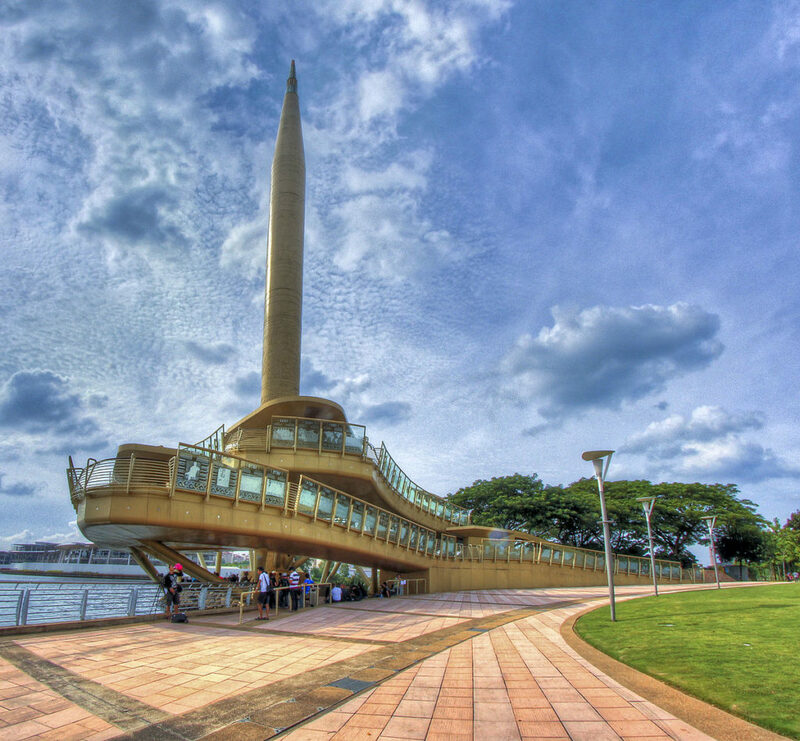 The Lake Garden Café next to the Monument is a good place to enjoy a relaxing drink and snack while watching the sunset over the Putrajaya Lake. They also hold flower festival, Kite Festival and part of My Balloon Fiesta. The pink-domed Putra Mosque is constructed with rose-tinted granite and can accommodate 15,000 worshipers at any one time. The mosque consists of three main functional areas – the prayer hall, the Sahn, or courtyard, and various learning facilities and function rooms. The design of the mosque is primarily from Morocco and Baghdad, the carvings are from Egypt, and the stained glass from Germany. 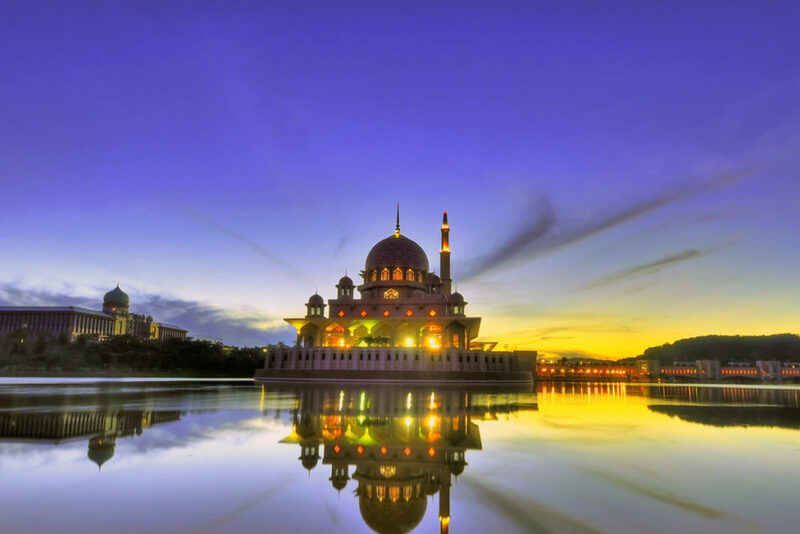 Putra Mosque has a pink-colored elaborate dome and brownish-pink 116-meter-high minaret. Non-Muslim visitors are welcome outside of prayer times.